4.1 out of 5 based on 40 bloggers and 4 commenters. 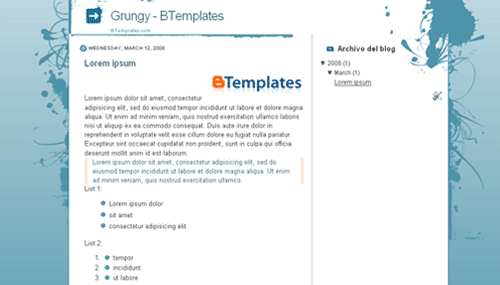 Grungy is a free blogger template with 2 columns, right sidebar, grunge style, gradients and vectorial elements. I just used this template. I have a jpg image from before in my header and I don’t know how to get rid of it. Can someone please help!! Thanks! No se como colocar esta plantilla en mi blogger, podrian explicarme. Realmente no se reconocer cual es la plantilla en htlm. I get an error when I try to upload it. Any suggestions?